BB NOTE: Matthew d’Ancona responds in the London Telegraph to Rowan Williams unfortunate lecture this week on sharia law in Britain. He hits on something quite interesting, besides just the cultural and political ramifications of Rowan Williams ideas (where the Archbishop clearly seems out of his element): Appeasement, which is born in despair. Last night at Truro, Tory Baucum taught on the joy that comes when we recognize that Jesus is Lord – what does that mean to us when we grasp the hope and confidence that He holds the future no matter how it looks today? How does one despair when Jesus is Lord? Things seem especially difficult for Rowan Williams now, as this short article makes clear here. In an interview with The World at One on Radio 4 the same day, Dr Williams made his case more accessibly, claiming that the adoption of certain aspects of sharia law “seems unavoidable”. 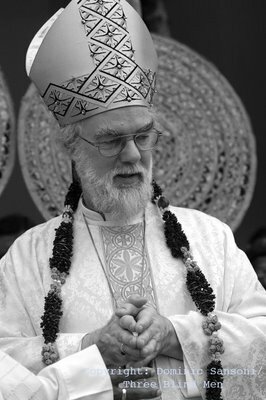 As things stand, he said, “there’s one law for everybody and that’s all there is to be said, and anything else that commands your loyalty or allegiance is completely irrelevant in the processes of the courts – I think that’s a bit of a danger.” Hence, the Archbishop’s enthusiasm “for finding what would be a constructive accommodation with some aspects of Muslim law”. Because Dr Williams has the hushed manner of a consultant oncologist reassuring a nervous patient, it is easy to assume that what he says is benign and full of common sense. Not in this case, however. In the name of liberal co-existence, the Archbishop took arms against the very principles that give our ever-more diverse, cacophonous and mobile society what cohesion it has. This was a very dangerous intervention. At Westminster, there is an increasingly lively debate on the nature of “Britishness”. Traditional Tories tend to argue that it is to be found in institutions; Gordon Brown suggests that what makes us British is our values. What all agree on is the binding force of the law. Equality before the law is, in practice, the most meaningful form of equality that we have. The universal franchise is exercised only sporadically. But the presumption of legal equality – the blindness of the goddess Justitia – is our best guarantee that ethnic minorities and religious groups have of fair treatment. Far from encouraging such groups to insist on special treatment, or juridical devolution, moral leaders such as the Archbishop should be doing precisely the opposite: identifying, defending and celebrating the legal common ground on which all citizens can and should gather. It is astonishing that a man of Dr Williams’s notional intelligence should end up on the side of legal apartheid and moral cantonisation, even in the euphemistic guise of “plural jurisdiction” or “transformative accommodation”. In a world of unprecedented mobility and confused identity, the certainty of equality before the law is needed more than ever. In his lecture, Dr Williams was a little bit sniffy about the Enlightenment, suggesting that it needed to be updated to fit the needs of modern society. Yes, he said, “equal levels of accountability for all and equal levels of access for all to legal process” are all very well. But “it would be a pity if the immense advances in the recognition of human rights led, because of a misconception about legal universality, to a situation where a person was defined primarily as the possessor of a set of abstract liberties and the law’s function was accordingly seen as nothing but the securing of those liberties irrespective of the custom and conscience of those groups which concretely compose a plural modern society.” Personally, I think we could do with a bit less anxiety about “custom and conscience” and a bit more “legal universality”. Please, sir: can we have the Enlightenment back? From time to time, I have the bad manners to write, pour memoire, that we are at war with fundamentalist Islam. This is not a pleasant fact, and certainly not a welcome one: most people in the West would like to believe that the problem of militant Islamism will recede once George W Bush leaves office in January. If only that were the case. Read the rest here. Tip of the Tinfoil to Greg at StandFirm.